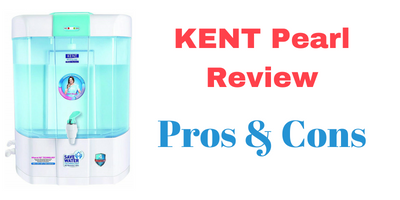 If you are looking for a water purifier with a transparent water storage tank which will give you confidence that the water you are drinking is 100% clean and clear then Kent pearl water purifier is ideal for you. kent Pearl comes with RO, UV and UF water purification. Additionally, it also comes with a TDS controller which qualifies it to purify any kind of water whether it is hard water like bore well water or soft water like water from Municipal water supply. It also has some good features such as built in SMPS, Push-Fit component and Hi-Power UV bulb. Now first let’s talk about the design and build quality of this water purifier. This is a wall mountable water purifier and you can also put it on table top and use it. This water purifier comes with a transparent water storage tank which is detachable as well. So you can remove the water storage tank without any help of professionals for cleaning purpose which is quite convenient. also the transparent water storage tank gives you the confidence that the water you are drinking is 100% clean and clear. This water purifier comes with a traditional Water dispensing Tap for dispensing water and it does its job very well. It also comes with two LED indicators. More about the LEDs below. Now let’s talk about the purification of Kent pearl. Kent Pearl comes with RO, UV and UF water purification Technologies. Additionally, it also comes with a TDS controller. Now let’s talk about each of its purification stage and the filters of this water purifier. the first stage of purification has sediment filter which removes visible or physical impurities like sand, mud, dust etc from the water, making it 100% clean and clear. The second stage of purification has activated carbon filter which removes harmful chlorine and chlorine by-products from the water which usually found in the municipal water as it is treated with chlorine for the purification. Additionally, activated carbon filter also removes bad taste and odour causing contaminants and volatile organic compounds (VOCs) from the water. 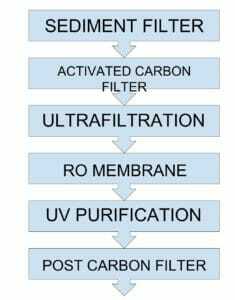 Ultrafiltration (UF) comes in at the third stage of purification. It removes remaining physical or visible impurities from the water. This stage basically works as a protector for RO membrane which is the next stage of purification. RO membranes are very delicate and they could get damaged due to physical or visible impurities likes sand, mud, dust and they are very costly as well. So the UF membrane removes such physical or visible impurities from the water before the RO purification. Once there are no physical or visible impurities remained in the water than the water is passed for the RO purification at fourth Stage. This stage is consist of RO membrane which has very minute pores of 0.00001 microns. Water is passed with a great force through this RO Membrane which separates dissolved salt and solids as well as heavy metals like mercury, arsenic and lead from the water. The fifth stage is of UV purification. This stage is consist of UV bulb. At this stage basically water is exposed to the UV rays of the UV bulb which inactivates harmful bacteria, viruses and protozoans from the water making the water 100% microbe-free. The sixth stage of purification is of Post Carbon Filter. This stage basically works as an polisher for the purified water. During a RO purification some essential minerals may get removed from the water. And the post carbon filter adds such essential minerals in the water which not only makes the water healthy but also it makes water tasty for consumption. Kent pearl does not use any kind of chemicals for the purification of water. The 6-stage water purification removes all the diseases causing contaminants which can cause serious diseases. Kent Pearl comes with a TDS controller which, as the name suggest allows you to control the TDS of the water. TDS controller is very essential if you have low TDS water. Because when the water is purified using RO purification, it reduces the TDS of the water by 90%. So if the water you want to purify has TDS of 1000 after a RO purification the TDS will be 100 which is not good for health. TDS between 250 to 500 is considered as good for health because it contain essential minerals. Usually Municipal water is a low TDS water and bore well water is high TDS water. Kent Pearl comes with a water storage tank of 8 litres which is made from Food grade plastic which is non-toxic and durable as well. The most interesting part about its water storage tank is, its transparent and detachable as well. So you can easily remove its water storage tank without any help of professionals, which is quite convenient. Kent Pearl comes with spin welded RO membranes. This type of RO membranes are stronger than the normal remembrance. Normal RO membranes are very delicate and they can easily get damaged due to physical or visible impurities like sand, mud or dust. RO membranes are very costly as well. So as Kent Pearl comes with spin welded RO membrane it will not get damaged due to such impurities. And this feature of this water purifier can save you a lot of money. Kent Pearl comes with high power UV bulb. 11 Watt UV bulb which is more effective in removing harmful bacteria, viruses and protozoa from the water. Kent Pearl comes with two LED indicators which will notify you whenever you will have to change its RO membrane and UV bulb which is very convenient and it ensures that you consume pure water every time. As far as other filters are concerned like sediment filter, activated carbon filter and post carbon filter you will have to change them annually. Know more about maintenance cost of RO water purifier. Kent Pearl comes with a built in SMPS. It basically works as a voltage stabilizer. It stabilizes the high voltage current during voltage fluctuations ensuring that no harm will cause to this water purifier during voltage fluctuations which insurance is its long life. All the components of Kent Grand Plus are push fit which basically means that they are attached to each other in such a way that it will not cause any kind of water leakage. Kent Pearl performs all its operations automatically like filling the water storage tank with purified water and it will also automatically shutdown the purification operation once the water storage tank gets fully filled which is very convenient. Users are very happy with the transparent and detachable water storage tank, this water purifier offers. Some people also found stains inside the water storage tank. Stains basically forms if the life of the RO membrane gets over because then it will not remove the dissolved solids and solids from the water and due to which the water containing dissolved salt will get directly stored in the water storage tank which form salt stains on it. So servicing the water purifier regularly is recommended to avoid such stains. Kent pearl comes with 1 year manufacturer warranty and 3 years of free servicing. Now lets see the Pros and Cons of Kent Pearl. If you are looking for a water purifier with a transparent water storage tank which will give you the confidence that the water you are drinking 100% clean and clear then Kent Pearl is ideal for you. this water purifier comes with RO, UV and UF water purification technologies additionally it also comes with a TDS controller which qualifies it to purify any kind of water whether it is hard water like bore well water or soft water like Municipal water. This water purifier also comes with two LED indicators which will notify you whenever you will have to change its RO membrane or the UV bulb needs to be changed, which is quite convenient. Also it comes with very good features such as SMPS which basically works as an voltage stabilizer, which insurance its long life. also it comes with high power UV bulb which is more effective in removing harmful bacteria, viruses and protozoa from the water. Additionally it comes with push fit components which prevents water leakage. Overall users are very happy with the transparent and detachable water storage tank of this water purifier and it’s purification. Some users also found stains on the water storage tank from inside if it is not serviced regularly. This was all about Kent Pearl Review. If you have any questions don’t forget to check out the FAQ section below. What is RO, UV, UF and TDS? RO stands for Reverse Osmosis. It is a pretty advanced water purification Technology which is used to remove harmful dissolved Salts and solids as well as heavy metal like mercury, arsenic and lead from the water. UV stands for Ultraviolet. It is also of Advanced water purification Technology which uses UV rays to remove harmful bacteria viruses and protozoans from the water. UF stands for Ultrafiltration. This is a basic water purification Technology. it is consist of UF membrane which removes physical or visible impurities like Sand, Mud, Dust and sediments from the water. TDS stands for Total Dissolved Solids. Water comes with dissolved solids and salts. Some of them are beneficial for our body whereas some of them are not. The harmful dissolved solids and solids are removed from water using RO purification. Does Kent Pearl come with warranty? How much water does it purifier in 1 hour? Kent Pearl purifies upto 20 litres of water per hour. How much water it will purify per hour is really depends upon the quality of the water and also the life of the filters. Can we remove the water storage tank for cleaning? Yes. The water storage tank of kent pearl is detachable and you can easily remove it for cleaning purpose without any help of professionals. Does this water purifier come with Save Water Technology? Kent Pearl does not come with save water technology. You can reuse the waste water coming out from this water purifier for many household works such as for mopping, cleaning, vehicles and for gardening as well. Does this water purifier come with pre filter? Kent pearl does not comes with a Pre-filter. Actually there is no need to use pre filter. But if you want to use it you can use it. It will add extra level of purification. What is the pH of the water purified by this water purifier? The installation is free unless you decide to buy anything (extra) from the Kent folks like pre-filter. Usually you will find pre filter cheaper online. How much water does get wasted during purification? To get 8 litres of pure water 4 litres of water will get wasted. you can reuse this water for many other household work suggest mopping, gardening, cleaning vehicles etc. Inside the box there is a water purifier only. As it is a wall mountable water purifier but you can also use it to put on table and use it. It is not necessary to have a proper stand for this water purifier. Also this water purifier does not comes with a pre filter inside the box. The pre filter is not necessary but if you wish to have one you can buy it online here. It will just add a more purification layer.